Back to Summer 2005. It was another beautiful day in New Hampshire and that meant a visit to the glacially carved Franconia Notch, perhaps most famous for being the site of the former "Old Man of the Mountain". We decided to take the cable car to the summit of 4,100 foot Cannon Mountain. 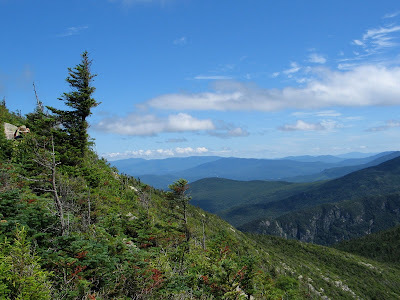 From the summit, the views of the White Mountains were outstanding. Franconia Notch is a large U-shaped valley cutting through the White Mountains that was formed by a large tongue of the continental glaciers that covered the region during the Ice Age. At the bottom of the valley, the forest is dominated by deciduous trees. At the summit, it is a dense boreal forest of red spruce and balsam fir. Here you can see the wind-swept conifers clinging to the rocky surface. This ancient granite is the rock that gives New Hampshire the nickname the "The Granite State". The view here is to the northeast and the tall peak you see way in the distance is "Old Speck" in Maine. Across Franconia Notch is 5200 foot Mount Lafeyette. It contains a small alpine zone on its summit. That white stuff that looks like snow is actually wet granite from the rainstorm the night before. We had originally planned to hike down from the summit. But, the trail was too steep and slick to do safely from the rainstorm. So, we decided to ride the cable car back down. On the way back down, we had this nice view of Echo Lake.